Is rum vegan? I know not all wines and beers are vegan but am not sure if Rum is or not and I have been unable to find the answer. If it is not I apologize. No worries though, this recipe would taste just as good with out it. So last night we were having company for dinner and as I put the Cottage Pie in the oven I realized that there was no dessert. Immediately I contemplated what kind of cake to make then I realized that it was an absolutely crazy idea. I began rummaging around the kitchen to see what I could make and this is what I came up with. Today I came home looking forward to a second helping and my husband had decided it made a perfect lunch for himself. Prep time was 15 minutes and then I put in the oven when we sat down for dinner and it took 40 minutes to cook. Take out Earth Balance before starting so that it may soften slightly. 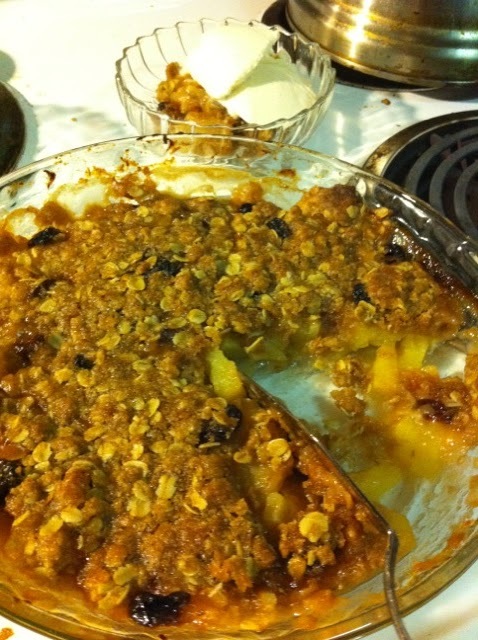 In 9″ pie dish (I prefer Pyrex) mix apples, pineapple, cinnamon, rum, and cherries. In a separate bowl mix oatmeal, flour, brown sugar and pumpkin pie spice. Cut Earth Balance into chunks and with a fork press it into the oatmeal mix until it is completely blended. It will be crumbly. Sprinkle oatmeal mix over the fruit so it is completely covered. Bake for 40 minutes. Let cool for 15. Even better served with your favorite vegan vanilla ice cream.